Patta Village. This new development is being built along Siam Country Club road in East Pattaya. An excellent Ex-Pat area offering an excellent of family activities, Western restaurants, highway routes throughout the Eastern Seaboard areas, and International schools. The house has been designed as a modern 2 storey, 3 bedrooms home. Sitting on one of the larger corner plots (172sq.m of land) it offers nice views, private parking,lovely corner plot gardens, and a large lower open plan living space, consisting of living room, bathroom, and kitchen area. On the upper floor are the 3 bedrooms, with 1 guest bathroom, plus the master bedroom including it own private en-suite bathroom. Sold fully furnished, this offers great value for money, either as a family home, or for rental investment. 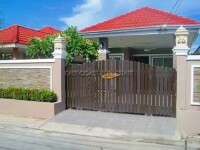 The property is held in Thai company name ownership. Take a look at this nice home for yourself, contact us to arrange viewings.